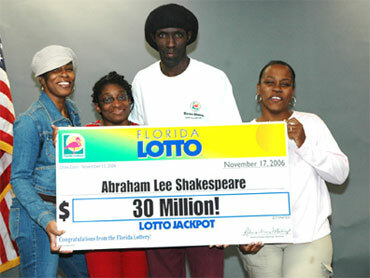 Winning millions of dollars in the Florida Lottery should have been the best thing that ever happened to Abraham Shakespeare. But with his newfound wealth in 2006 - $17 million in a lump sum payment - came a string of hangers-on who constantly hit him up for money. Nine months ago, he vanished. Friends and family hoped he was on a beach somewhere in the Caribbean. But on Friday, detectives confirmed that a body buried under a concrete slab in a rural backyard was his. The home Shakespeare was found behind belongs to the boyfriend of a woman who befriended him in 2007. Authorities believe he was murdered and the woman may know something about it, but they do not yet know how he died and have not arrested anyone. Shakespeare's brother, Robert Brown, said Friday that Shakespeare often wished he had never bought the winning ticket. "'I'd have been better off broke.' He said that to me all the time," Brown said. Hillsborough County sheriff's detectives used fingerprints to identify Shakespeare's body, which they found covered by a concrete slab. Before 2006, Shakespeare was an assistant truck driver who lived with his mother. He was barely literate and had a criminal record. After he won the lottery, he bought a million-dollar home and was extremely generous to others. "He really didn't understand it at all," said Samuel Jones, a friend since childhood. "It was moving so fast. It changed his life in a bad way." Jones said Abraham would tell him, "I thought all these people were my friends, but then I realized all they want is just money." Among those new friends was Dorice Donegan "DeeDee" Moore. She told him she was interested in writing a book about his life, but officials said she was interested in his money. Moore, whose known phone numbers were all disconnected Friday, became something of a financial adviser to Shakespeare. Property records show her company, American Medical Professionals, bought his home for $655,000 a year ago. Not long afterward, detectives said, she helped him open a company and gave herself the ability to sign for money. She withdrew $1 million and later told detectives Shakespeare gave her the cash as a gift. She bought a Hummer, a Corvette and a truck, and went on vacation. "DeeDee Moore is a con artist," Polk County Sheriff Grady Judd said in a news release earlier this month. "DeeDee Moore has cheated Abraham Shakespeare out of his money, and possibly his life." A tip led detectives to Shakespeare's grave site this week, behind a home owned by 26-year-old Shar Krasniqi, identified by Judd as Moore's boyfriend. Meanwhile, friends and family puzzled Friday over Shakespeare's rapid rise and fall. Jones said his friend lived a humble life, and just before he bought the winning ticket he joined a church and was baptized. "When he won the lottery," Jones said, "he forgot about being saved."